Sometimes you really just want something sweet and creamy, and maybe just a bit like Coldstone Creamery. Am I alone in that? I mean, here it is summer (FINALLY! If you live in western PA, you know exactly what I mean....so. much. rain. ); shouldn't every occasion end with a nice creamy milkshake or scoop of soft serve? Let me answer that for you: yes, yes, it should! But what if you're trying to be "good" and healthy? What if you are following the Fix plan? What are your options? You know I have the solution, right? Of course I do! 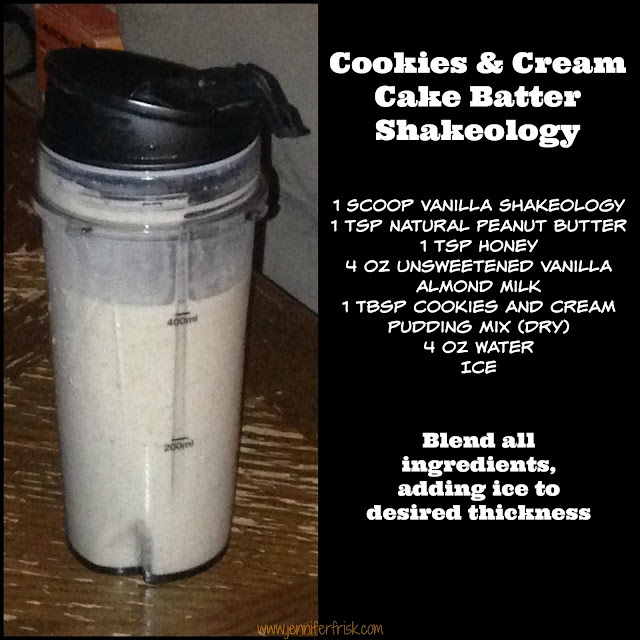 Enter Cookies & Cream Cake Batter Shakeology! If you want more of a shake, use less ice. If you want more of an ice cream dessert, use more ice. No, this isn't perfectly clean (thank you pudding mix! ), but it sure beats the alternative! Do not be tempted to forego the peanut butter! I promise it doesn't taste like peanut butter; it just gives the shake/dessert a creamy texture and a depth in flavor that this really really needs.